Why Did the Cowboys' Defensive Plan Fail? After the Redskins game, I noted that despite losing, Washington successfully exploited a weakness in Michael Vick’s game by blitzing him on almost every third down and goal line situation. Naturally, I expected Rob Ryan’s physical Cowboys defense to pursue a similar strategy. In some ways Dallas did mold their initial game plan around this strategy. Ryan often blitzed an extra defender off the edge, and sometimes succeeded in getting pressure and forcing Vick to make poor decisions. For example, they sacked Vick this way on the Eagles first play from scrimmage. He was also slightly less effective the whole night when the Cowboys brought at least one blitzer (all four sacks, yards per attempt down about one yard, completion percentage down over 20 percent). However, there are a few reasons why Ryan’s strategy failed to pay off against the Eagles offense. For starters, LeSean McCoy. The Eagles running back is such an elite force that you have to respect him in your defensive scheme. A couple of times Dallas brought extra rushers but were burned when McCoy broke through the line and already reached the third level of defenders. When Andy Reid actually commits to the run the way he’s done the last two weeks, it becomes more difficult to focus solely on Vick. Second, when Dallas did blitz they did so without general awareness. One of the keys to blitzing against Vick is that you have to keep containment. 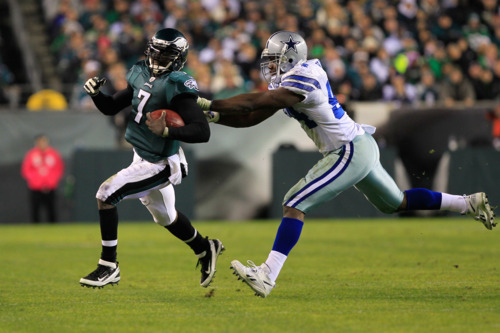 Frequently, Cowboys were streaking up the field, leaving wide lanes for Vick to take advantage of with his legs. Reid and Marty Mornhinweg also dialed up a bunch of different screen passes that seemed to take the Dallas defenders by surprise. If you’re going to blitz the Eagles, at least be prepared for that possibility. Finally, Ryan didn’t copy the Redskins’ model exactly. He generally blitzed an additional defender or two, not resorting to zero coverage. And when they didn’t blitz, Dallas dropped their safeties way back, exposing chunks of the middle of the field that the linebackers needed to cover. The Cowboys linebackers were not up to that task. It was an amazing Casey Matthews-esque performance from that group. I’d still expect opponents to try blitzing Vick. But those teams will have to learn from the Cowboys’ mistakes if they want to make that strategy successful against this multifaceted and explosive offense. Tagged with Philadelphia Eagles, NFL, Dallas Cowboys, Blitzing, Rob Ryan, Andy Reid, Marty Mornhinweg, Michael Vick, LeSean McCoy, Screen Pass, Linebackers. November 2, 2011 by Brian Solomon.